The motor unit that controls and powers the movement of your automatic garage door is called the opener. This motorized device uses a type of drive system to physical push and pull the door open, while the actual weight of the panels is supported and counter balanced by the lift cables and the springs. When an opener breaks down, things can become very inconvenient, and in some cases dangerous too. Professional training and experience is usually required to deal with problems, which is why you should reach out to our team as soon as you discover something's wrong. Oftentimes, especially after your opener gets on in years, it will start to experience more frequent problems, and the time will come when it will need to be replaced. This isn't necessarily a bad thing, as many modern models today use a lot of innovative technological features that can make them a great addition to any home. Nowadays, garage door opener models can be operated remotely via your very own smartphone. Their Wi-Fi connectivity allows them to be controlled and even monitored from virtually anywhere in the world, which also means you can do away with the old style remote control people used to have to carry with them. There's also the option to have the unit integrated with a backup battery system, which will allow it to continue to function during power outages, and thus be more reliable during emergencies. There are many other functions and features available today, naturally, and modern models are also far quieter and more reliable than their predecessors. It's important to consult with experts before buying a new opener, to ensure that you're getting the best one for your specific needs. Openers can be divided into three categories, depending on the type of drive system they use, and each one has distinct advantages and potential downsides. A chain drive opener would be far cheaper than its counterparts, but also usually stronger and more reliable. However, it is also the loudest option. A belt drive model is more expensive, but far quieter, near silent even. A screw drive unit is the fastest type and also the one that requires the least amount of maintenance. However, it is not silent by any stretch, and can be affected by temperature shifts. 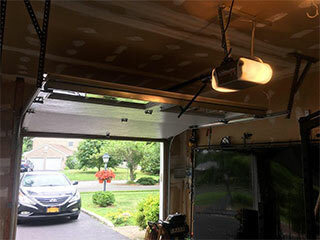 There's also the jackshaft garage door opener, which isn't as common, but is a great choice for those without enough backroom space available. Our professional technicians at Garage Door Repair Woodstock will gladly assist you with any type of problem your motor unit may start to experience, from worn gears to circuit board issues. If you're looking to replace it with a new model, our opener installation experts can help you make the right choice and ensure that the new unit is set up correctly.